Our high quality swimming pool overflow grating is made of Polystone® D (PE-HMW) and offered in bespoke dimensions, shapes and colours to harmonize with the design of your pool. Made of the plastic High Molecular Weight Polyethylene (PE-HMW) it is safe, hygienic and durable. Our swimming pool grates locks together using male/female locators, making it strong and safe and preventing lifting and gapping. We manufacture your pool gratings to your exact specification. By involving our manufacturing and quality teams directly in your project, you have access to their experience and knowledge to help identify the opportunities made possible by CNC machining of engineering plastics. The end result is a safe, hygienic and durable bespoke product. Proven quality: Our pool gratings have been used worldwide for over 25 years. Designers and engineers consider many factors when planning and building swimming pools. Design is important and safety even more so. The best effect is when the design flows seamlessly from wet to dry areas and we can help achieve that. 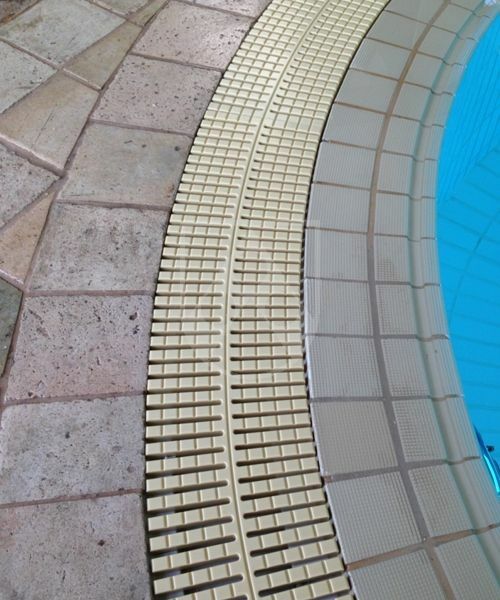 We manufacture swimming pool overflow gratings in bespoke colours, shapes and sizes for your design. Our overflow channel gratings are available standard in blue, white or black, and any RAL colour to your specification, so they can be colour matched to suit your decor. Corner sections are available in 90° and 135° angles, or bespoke angles. Corners and joints are the most vulnerable part of your pool grating, so we manufacture strong, secure corners to the exact angle you require. 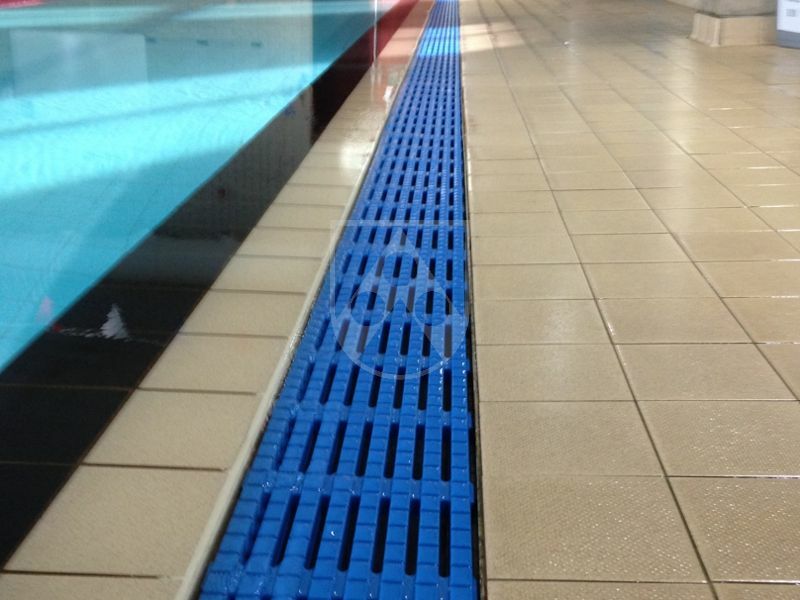 Pool gratings made of Polystone® D conforms to Health & Safety guidelines DIN Standard 51097 red class C of Anti-slip Coefficient of Friction, a German standard that tests slip resistance of flooring in barefoot conditions using soapy water as a contaminant. Polystone® D pool gratings do not crack, splinter, rot or delaminate. They are designed to meet the high safety requirements for swimming pools. Pool gratings made of Polystone® D require little maintenance. They are easy to clean with common cleaning agents and impervious to algae. Polystone® D overflow channel gratings are resistant to chlorine, sea water, cleaning agents, UV and weathering. 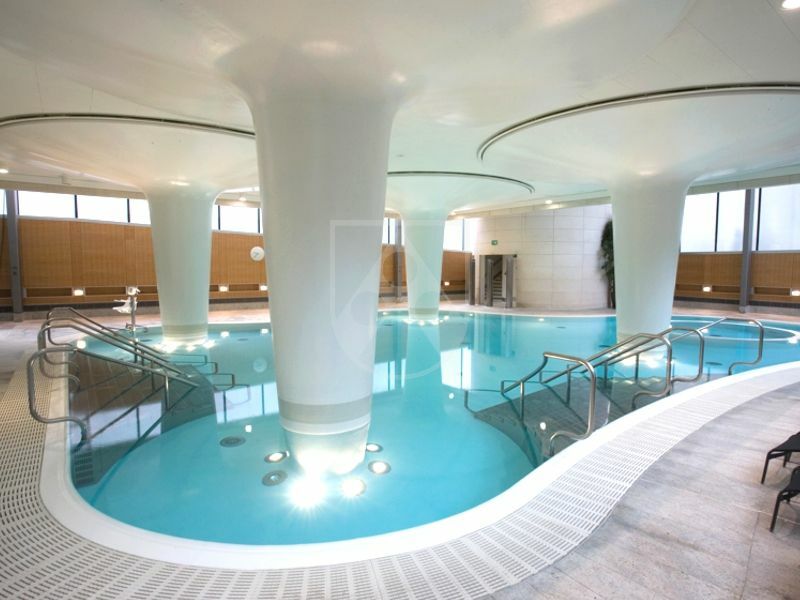 Therefore they can be used for indoor and outdoor swimming pools. With a density of 0.96 g/cm³ pool gratings made of Polystone® D are easy to handle and lighter than other conventional materials like stainless steel. This allows easy installation as well as easy removal when cleaning the overflow channel is necessary. Polystone® D pool gratings combine very good stability with high strength and impact resistance. This provides a safe surface to walk on. We are happy to help with the planning and design of your pool grating and advise you on the properties of Polystone® D. Just use our contact form at the bottom of the page and write to us.